You could serve cold cheese and crackers. 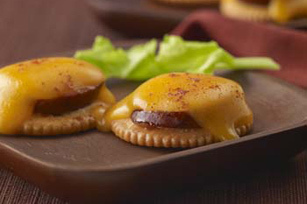 Or you could knock their socks off with crackers topped with Memphis-style smoked sausage and cheese. Your call. Cut each cheese slice in half. Place 6 crackers on microwaveable plate; top each with 1 sausage slice and 1 cheese slice. Sprinkle lightly with paprika. Microwave on HIGH 10 to 15 sec. or until cheese begins to melt. Prepare using KRAFT 2% Milk Cheddar Cheese and turkey kielbasa. Prepare using your favorite variety of KRAFT Cheese. Heat grill to medium heat. Grill kielbasa 8 to 10 min. or until done, turning occasionally.